Padlocks are made in different shapes, sizes and other properties depending on the security level desired, convenience and adaptability to the weather. 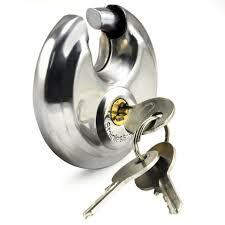 However, whatever the design, all locks have three components; the body, shackle and locking mechanism. In this case, the body has extended shoulders that go around and cover a significant portion of the fetter, leaving only a small portion for slipping through the hasp, cable or bar. The concealed shackle makes it harder to cut or pick, making this padlock a higher security padlock. However, the increased security is a trade off with a longer shackle clearance needed for some applications such as gym lockers, school and office cabinets. At school or gym, the best locks for gym cabinets have a wider clearance to go through the concealed hasps. These have a straight and shrouded shackle that opens by sliding outwards. They find use in the locking mechanism for roller-shutter entrances. Besides roller shutters, they can also serve as high security closed shackle locks appropriate for shipping containers, warehouse gates, and so on. For this type of lock, the shackle is curved and it slips all around or half way the circumference, from one end to the other. This makes it a high security padlock since the shackle is difficult to access or pick. The body is normally a disc with a center keyway. The shackle doesn’t have a spring and therefore it doesn’t open when the keyway is damaged, leaving the padlock intact and locked. This is simply a padlock in which the clearance (area between the fetters above the padlock are body) is extended into a long U-shape. This increases convenience for locking long hasps, chains, and cables that you have to lasso. However, the shackle is a padlock’s weakest point and the larger shackle clearance provides a larger surface for bolt or saw cutting and picking with a claw hammer. This decreases the security rating of this lock.